Henry Kable – Susannah Holmes – First Fleeters who arrived at Sydney Cove on 26 January 1788. First Fleeters who arrived at Sydney Cove on 26 January 1788. This newer version website has additions to and extensions of its forerunner created in preparation for the Kable-Holmes Family Reunion at Windsor NSW Australia, which was held on February 10 and 11, 2018 to celebrate the 230th Wedding Anniversary of H & S.
An Acknowledgement of Country is an opportunity for anyone to show respect for Traditional Owners and the continuing connection of Aboriginal and Torres Strait Islander peoples to Country. It can be given by both non-Indigenous people and Aboriginal and Torres Strait Islander people. We begin by acknowledging the Traditional Owners of the land on which we live [meet today], the ATSI people of the “AUSTRALIAN NATION” and pay our respects to Elders past present and emerging. On the 10th and 11th of February 2018 at Windsor NSW, Australia, descendants of the first white people to settle on the DARUG land at Sydney Cove in 1788, gathered to celebrate the 230th wedding anniversary of their ancestors Henry & Susannah. Windsor NSW is also located on country of the DARUG nation. At the opening session of this celebration, the Kable descendants were welcomed to Country by DARUG woman Rhiannon Wright, in local language as well as in English. The purpose is to share the rich historical fabric of “our KABLE-HOLMES family history” that commenced with the beginning of the nation of “Modern Australia 1788”. Committing the story of Henry & Susannah to a digital platform, enables this family’s contribution to Australian Folklore, to be accessed outside a traditional library or book source. Further it provides one family’s snapshot of their social, cultural and familial history. Further the ever-increasing number of descendants/progeny of First Fleeters Henry Kable and Susannah Holmes can be “squeezed” into bits and bytes more readily than an A1 format poster. Currently upwards of 5000 persons are included. As well, this website presents an interactive opportunity to connect ongoing stories and contributions from those interested descendants, whose research has formed the tree and caused the growth of the branches, twigs and leaves. These “researchers” can loosely be referred to as “the chosen” described in the “POEM” beside. Their efforts collated here, have contributed to this digital version of the KABLE-HOLMES DESCENDANT’S story. The significance of the KABLE-HOLMES story is not just for the descendants but equally for its place in modern Australian folklore, as Henry and Susannah were one married couple amongst approximately 1,500 participants in the FOUNDING OF MODERN AUSTRALIA, 26th January, 1788. Thus, this website brings together “SOME” of the numerous stories records and notable occurrences from the intervening 230 years. To the date of 10th February 2018 Henry, Susannah and their descendants brings this website to you. A page for comments and suggestions has been added to the site to encourage social communication to maintain the “story” of one FIRST FLEET FAMILY of the Colony of NSW 1788 and their descendants. Further this website attempts to bridge the family celebrations of the BICENTENNIAL year 1988 forward to the SESTERCENTENNIAL (250 years) celebrations of the founding of MODERN AUSTRALIA (2038). Maintaining the story in a contemporary frame of reference is seen to be equally worthy as that of the producers of the story Henry & Susannah. Living family members acknowledged by name here, for their special, unique and substantial contributions to the KABLE-HOLMES story include June Whittaker OAM (author), NSW; Commodore Paul Kable AM RAN (rtd) (author) NSW. ; Bryan Thomas (author) and Zillah Kable-Thomas-Campbell (1988 Family reunion convenor) and Kable family papers (SLNSW), NSW; Roslyn Robinson (Family tree records and archives), NSW; Johan and Jane van Woerkom (author), NSW; Sharon Lamb (FFF Director) and Bob Richards (FFF Website technician) . Greater detail of their contributions will be provided later. Many many many other descendants research and contributions have been used/referred to throughout this site and will also be acknowledged in more detail later in this site, including for example Julia Kable’s contribution. Gladys Busch and her husband Noel were both Churchill Fellowship Awardees. Gladys’ focus in her study tours were “ARTISAN DOLLMAKING”. In developing her skills as an Artisan Doll Maker she provided the Historical Dolls/Figurines for the 1988 Bi-Centenary Celebrations of the Founding of Modern Australia. Included in this collection were the Henry and Susannah “dolls.” For the recent 230th wedding Anniversary Reunion at Windsor NSW – February 10&11 2018 Gladys created the “contemporary version of Henry and Susannah and brought forward their story by also creating their eleven children. Photographs of Gladys’ Artisanship work forms the photographic backdrop of the website and selected other pages. Special thanks to Gladys and Noel! Thus this website brings the many and various combined efforts of KABLE-HOLMES descendants and their stories from Norfolk and Suffolk, England from 1700, forward to Australia 2018 and through the WordPress blog options will assist in continuing the building of the KABLE-HOLMES FOLKLORE. Before the story of Henry and Susannah there were many beginnings. Many migrations explorations and discoveries. The use of technology has enabled user friendly “stories” to outline the narrative of Human development growth and migration to “new worlds”.Commonly accepted research now states that early humans migrated out of Africa and succeeded in the competition with other species on the planet and today “manage” that success. YouTube provides one such story presentation of the earliest human and migrations (see this link). Also Timeline has documented many articles. However recent developments arising from DNA research into the “migration patterns of Human Beings” provides an even clearer picture of the links amongst peoples and the shared history of us all. 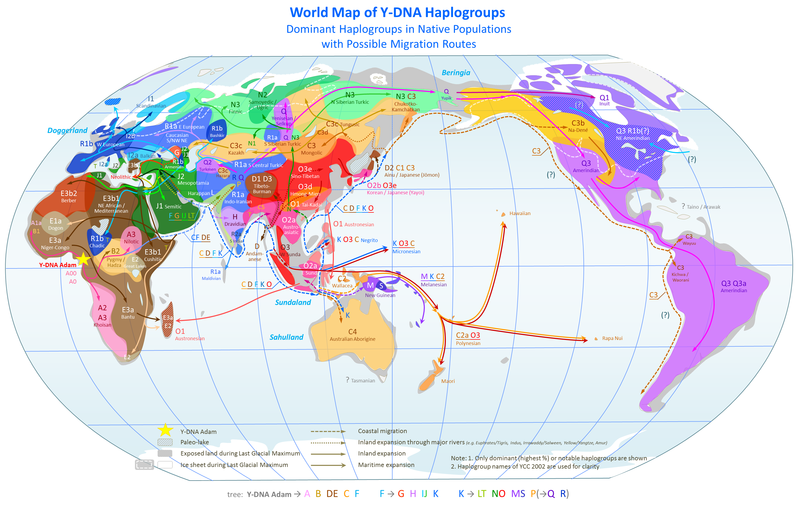 By tracking DNA movements and settlements research groups such as National Geographic researchers have been able to produce a humankind migration model as seen below in National Geographic’s – Genographic Project. This visual model enables a hypothetical mock-up, supported by strong research results and DNA mapping methods, which provides another story of mankind and ancient movements. ANCIENT MIGRATION ROUTES – In this next section the pre-Henry and Susannah story is paid due respect. These ancient migration routes tell briefly humankinds’ migration, before the story of our Ancestors First Fleet migration from England to the Colony of New South Wales Australia. It also briefly tells of the migration before Henry and Susannah- the migration of the pre-existing dwellers the Traditional inhabitants of “Terra Australis”. Tongue in cheek we might say Henry and Susannah took the long way around … or the scenic route! Thus, recent advances in DNA research have taken the customary fieldwork explorations and research from outdoors to the inside laboratory where theoretical models of ancient migration routes have been developed and displayed (as below), telling another story of how mankind has been on the move exploring, discovering and engaging with planet earth for somewhere between 300,000 and 400,000 years. More can be learned of this story by deferring to the information presented in the below links and map outline. For ten years, Genographic Project scientists have explored and explained how patterns in our DNA show evidence of migration out of Africa and across the globe. But new research shows that eventually some of our ancient ancestors also moved back. (Nat Geo Explorers Journal / ref. source). Click here for a larger image of the map. The humankind migrations referred to above are wondrously significant but in each time and place a new migration, exploration and discovery has added to the rich fabric of each groups discoveries. Mankinds’ quests to learn and come to know who we are and where we come from continues today. Henry and Susannah’s migration story is pre-dated and further detailed with reference to the most recent (last 1000 years) discoveries leading up to Terra Australis / modern Australia settlement. ANCIENT AUSTRALIS – Australian anthropology digs have found evidence of Aboriginal habitation up to 80,000 years ago. Artifacts in Kakadu national park have been dated between 65,000 and 80,000 years old, extending likely occupation of area by thousands of years. These findings also suggest people crossed over from south Asia at a time that was cooler and wetter, with lower sea levels allowing easier sea crossings (The Guardian – Helen Davidson at Madjedbebe and Calla Wahlquist- Thu 20 Jul 2017 00 AEST). AUSTRALIS IN ANTIQUITY – The existence of Terra Australis was not based on any survey or direct observation, but rather on the idea that continental land in the Northern Hemisphere should be balanced by land in the south. This theory of balancing land has been documented as early as the 5th century on maps by Macrobius, who used the term Australis on his maps. TERRA AUSTRALIS – (Latin for South Land) was a hypothetical continent first posited from the time of the great Greek and Roman civilizations and began to appear on maps between the 15th and 18th centuries. Europeans had been searching for rich new lands in the Southern Hemisphere long before Captain James Cook arrived on the east coast of Australia in 1770. SPANISH EXPLORATION – In a quest to advance Catholicism and discover new sources of natural resources and precious metals, early Spanish explorers opened up many parts of the world to European settlers. They are considered the first Europeans to discover Vanuatu and what is now known as the Torres Strait. DUTCH EXPLORATION – The most significant exploration of Australia in the 17th century was by the Dutch. Commissioned by the world’s largest trading company at the time, the Dutch East India Company (Verenigde Oost-Indische Companie or VOC), Dutch explorers charted much of the Southern Hemisphere in search of its famed riches. Dutch sailors made their first landfall on Australian shores in 1606. By the time Captain Cook arrived nearly 170 years later, the Dutch had charted all but the south-eastern coastline of the continent they called ‘New Holland’. BRITISH EXPLORATION – Fanciful notions of the far South Land were also common in the English imagination. Successful explorers were held in high-esteem, as many longed to discover the untold treasures that lay beyond the equator. Whilst English exploration of the Southern Hemisphere began in 1577 with the voyages of Francis Drake, it wasn’t until the late 18th century that expeditions finally revealed the true extent of the region and the final pieces of Terra Australis Incognita. Dalrymple’s book was read with interest by those mounting the 1770 expedition to view the Transit of Venus in Tahiti. Joseph Banks, members of the Royal Society and the Admiralty took Dalrymple’s research into account, particularly when issuing Captain James Cook’s expedition with secret instructions to seek the Southern Continent after their scientific observations in Tahiti. 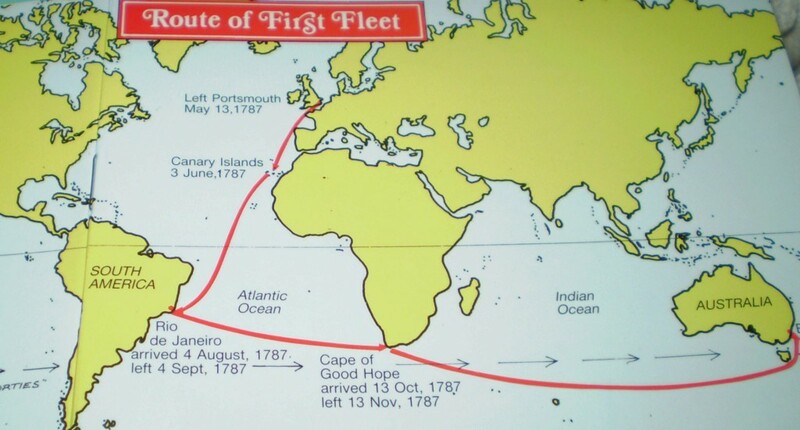 Captain James Cook’s confirmation of the great south land lead to the establishment of the colony of NSW following international events involving the British colonies in the Americas and thus through other circumstances Henry and Susannah came to be unwitting participants in the foundation of a nation. Henry Kable and Susannah Holmes born in 1763 Suffolk and 1764 Norfolk, England (respectively) were young English persons who became victims of their time in England. The Inclosure Acts from 1604 to 1914 saw 5,200 Acts passed. These acts removed available land for people to farm and graze and thus changed the way people were able to provide food and shelter for themselves. Often this lead people to move away from family supports/networks to find work and when payment for work couldn’t be found, crimes of theft occurred. Thus according to the times, Henry and Susannah, were each found guilty of such crimes of theft, in 1783 and 1784 (respectively). Sentenced to death both were reprieved (aged 19 years) but sentenced to transportation to the American Colonies. When the American War of Independence from England ended (1783), England was no longer able to transport convicted felons to the American Colonies and alternative locations were sought. Thus Henry and Susannah became part of the convict transportation BEYOND THE SEAS to TERRA AUSTRALIS. When the American Colonies were no longer receiving convicts from England, King George III, ‘with the advice of his Privy Council’ directed Lord Sydney (Thomas Townshend) to instruct Arthur Phillip to prepare a fleet of ships to commence transportation of convicts to the GREAT SOUTH LAND. The first Instructions included Phillip’s Commission as Captain-General and Governor-in-Chief of New South Wales. An amended Commission, dated 25 April 1787, designated the territory of New South Wales as including ‘all the islands adjacent in the Pacific Ocean’ and running westward to the 135th meridian, that is, about mid-way through the continent. The Instructions advised Phillip about managing the convicts, granting and cultivating the land, and exploring the country. The Aborigines’ lives and livelihoods were to be protected and friendly relations with them encouraged, but the Instructions make no mention of protecting or even recognising their lands. It was assumed that Australia was terra nullius, that is, land belonging to no one. This assumption shaped land law and occupation for more than 200 years. The First Fleet Over 252 days, the First Fleet brought over 1500 men, women and children half way around the world from England to New South Wales. On 13 May 1787, the fleet of 11 ships set sail from Portsmouth, England. Led by Captain Arthur Phillip, this historic convoy, which later became known as the First Fleet, carried officers, crew, marines and their families, and convicts from Britain to a distant and little known land on the far side of the world (see more….). Figure 3. “The Founding of Australia. By Capt. Arthur Phillip R.N. Sydney Cove, Jan. 26th 1788” / Original [oil] sketch  by Algernon Talmage R.A.
Edited extract from Arthur Bowes Smyth’s Journal – ship Surgeon on Lady Penrhyn, diarist and natural history artist “Journal writer” – written between March 1787 and January 1788. Other website contributions to recording Australian migration history timeline can be seen by clicking here. THE FIRST MARRIAGE CEREMONY AND A CHILD IN THE YEAR 1788 OF THE COLONY OF NEW SOUTH WALES (AUSTRALIA). Henry and Susannah, were married in the first marriage ceremony conducted in the colony 10th February 1788, two weeks after the flag of settlement was raised in the newly established English Colony of New South Wales (Australia), 26th January 1788. Henry and Susannah’s marriage which is recorded in St Phillip’s Church Sydney, Register as the third of five couples married on that day, with an “X” marking their names. Notably, Henry and Susannah’s marriage was the only marriage to produce children who survived to adulthood. One other couple William Bryant and Mary Broad/Braund/Bryant had a child Emmanuel born April 1790 who died in 1791. Mary “Bryant” also had a daughter Charlotte, on board Ship Lady Penryhn, Baptised at Capetown (October/November 1787) and who also died in infancy. Susannah Holmes-Kable (wife of Henry and mother of their 11 children) (1764 – 1825); Henry Kable (First Fleeter, husband and father) (1762 – 1846); H&S’s daughter Diana Kable-Gaudry-Teale (1788 – 1854); William Littleton Gaudry, first husband daughter Diana 1778 – 1816); Diana’s second husband John Teale (1789 – 1852); Diana and John Teale’s two unmarried daughters Caroline Emmaline Teale (1821 – 1854) and Diana Blanche Teale (1823 – 1843); Edgar James Kable (1806 – 1849). Also interred, somewhere in the grounds of the Church, but the exact location is unknown, is John “the boxer” Kable (1802 – 1859). When embarking on the telling of a family history story and especially one that has such a rich historical fabric as that which commences with the beginning of a nation, then an introduction is deserved. In this instance the primary persons are our First Fleet convict ancestors Henry Kable and Susannah Holmes…. Equally, there was a gathering of some 200 descendants on the banks of the Hawkesbury River Windsor on Sunday 28th January 1968 (See news item report at SMH Friday the 26th January 1968- source https://www.newspapers.com/ ). See also June Whittaker’s contribution and presentation at the 230 years celebrations at Windsor, 2018 Genesis of Kable Reunions. In the Bi-centenary year 1988, Zillah Kable organised another reunion of significance, (500 PEOPLE ATTENDED) which was held at the Regent Hotel (site of the early gaol where Henry was Chief Constable and next door to where the home was in George Street Sydney-location of THE ROCKS). See link to “THE BIG REUNION” above. Windsor NSW, 10 and 11 February, 2018- Johan and Jane van Woerkom co-ordinated, planned, organised and managed the FAMILY REUNION in conjunction with the support of many family members mentioned and acknowledged in the reunion Program Kable Reunion Book. IRONICALLY, Johan van Woerkom- a Dutch born person- married to Jane van Woerkom (a Diana Kable-Gaudry-Teale descendant) is working to complete the explorations, of his mariner compatriots of the 17 century. Thank you to all the family past, present and future who made/make/will make the folklore be! In developing this website many resources have been referred to both public and private especially those of KABLE-HOLMES descendants who have broadly and specifically researched the story and /or their particular family line. Click here to go to the Resources page.